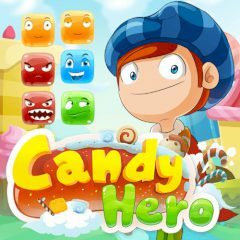 Candy Hero is a boy who is crazy about candies. His world consists of candies and he has some special candies with a great effect. Match candies of the same color to make them disappear and gain points for it! Complete levels playing for Candy Hero and make the wall of candies disappear before it smashes him. Do everything fast and match the color of the candy with others candies in the layout. Spend points on purchasing special candies which help to disassemble the wall quickly. Don't waste a second of your time and solve this candy madness!